Products – Cameras – CM-G660 – Team Research Inc. 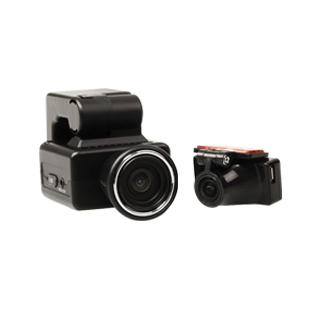 This car DVR has two cameras that allows for recording high definition videos from two different angles. This is your road eye for everything occurs while you are driving. The high quality video and audio can be timely and strong evidence to address accident and distinguish responsibility. • 3-axis shock detection sensor, checks accurate images with digital zoom function. • Recycle Record for covering old history to save space and auto record once engine starts. • Freely adjusted upwards/downwards while the wide viewing angle (120 degrees) enables monitoring of the vehicle exteriorSounds are recorded through the built-in microphone. • Through the configuration window, users are able to modify the recording speed, video quality, sensor sensitivity, voice recording settings and other settings.